This report is the outcome of the meeting “Environmental and Human Health Consequences of Arsenic” held at the MDI Biological Laboratory in Salisbury Cove, Maine, August 13–15, 2014. Human exposure to arsenic represents a significant health problem worldwide that requires immediate attention according to the World Health Organization (WHO). One billion people are exposed to arsenic in food, and more than 200 million people ingest arsenic via drinking water at concentrations greater than international standards. Although the US Environmental Protection Agency (EPA) has set a limit of 10 μg/L in public water supplies and the WHO has recommended an upper limit of 10 μg/L, recent studies indicate that these limits are not protective enough. In addition, there are currently few standards for arsenic in food. Those who participated in the Summit support citizens, scientists, policymakers, industry, and educators at the local, state, national, and international levels to (1) establish science-based evidence for setting standards at the local, state, national, and global levels for arsenic in water and food; (2) work with government agencies to set regulations for arsenic in water and food, to establish and strengthen non-regulatory programs, and to strengthen collaboration among government agencies, NGOs, academia, the private sector, industry, and others; (3) develop novel and cost-effective technologies for identification and reduction of exposure to arsenic in water; (4) develop novel and cost-effective approaches to reduce arsenic exposure in juice, rice, and other relevant foods; and (5) develop an Arsenic Education Plan to guide the development of science curricula as well as community outreach and education programs that serve to inform students and consumers about arsenic exposure and engage them in well water testing and development of remediation strategies. This meeting report is the outcome of the summit “Environmental and Human Health Consequences of Arsenic” held at the MDI Biological Laboratory in Salisbury Cove, Maine, August 13–15, 2014, sponsored by the MDI Biological Laboratory, Nature’s One, Inc., and the Superfund Research Programs at the University of Arizona and the Geisel School of Medicine at Dartmouth. The goal of the Summit was to bring together a diverse group of individuals, including scientists, college and secondary school educators, environmental lawyers, science writers, and representatives from the local, state, and federal government to discuss the emerging evidence that exposure to arsenic in drinking water and in food is a global public health crisis. The Summit began with a presentation by science writer Deborah Blum, who spoke about the history of arsenic as a poison based on her book titled The Poisoners Handbook: Murder and the Birth of Forensic Medicine in Jazz Age New York . The second day was dedicated to discussions about the effects of environmental arsenic on public health and identifying common interests. During the last day, participants self-assembled into five action teams; each team developed a set of goals and timelines to achieve those goals, including (1) establishing science-based evidence for setting standards at the local, state, national, and global levels for arsenic in water and food; (2) working with government agencies to set regulations for arsenic in water and food, to establish and strengthen non-regulatory programs, and to strengthen collaboration among government agencies, NGOs, academia, and others; (3) developing novel and cost-effective technologies for identification and reduction of exposure to arsenic in water; (4) developing novel and cost-effective approaches to reduce arsenic exposure in juice and rice, while encouraging the consumption of rice, a major food staple in the world, with low or no arsenic concentrations; and (5) developing an Arsenic Education Plan to guide the development of K-12 science curricula as well as community outreach and education programs that serve to inform students and consumers about arsenic exposure and engage them in well water testing and development of remediation strategies. Arsenic is the number one environmental chemical of concern with regard to human health both in the USA and worldwide [2, 3•]. The World Health Organization (WHO) has stated that human exposure to arsenic represents a significant health problem worldwide that requires immediate attention [3•, 4]. The US Agency for Toxic Substances and Disease Registry (ATSDR) and the US Environmental Protection Agency (EPA) list arsenic as the number one toxic substance of concern to human health . Worldwide, approximately one billion people are exposed to arsenic in food and over 200 million people ingest arsenic in drinking water above the WHO standard of 10 μg/L [3•]. In addition, individuals are also exposed to arsenic through contaminated water used in food preparation, smoking tobacco, eating poultry fed organic arsenicals, and from industrial processing [6, 7•, 8, 9]. Arsenic in drinking water in Southeast Asia, South America, and the USA, where levels in some regions are as high as 4000 μg/L, has been associated with increased rates of cancer of the bladder, lung, liver, prostate, and skin; cardiovascular disease; reproductive and developmental problems; diabetes and other endocrine problems; respiratory disease including chronic obstructive pulmonary disease (COPD), and bronchiectasis; and immunological and neurological problems, as well as acute and chronic infections, including pneumonia [3•, 10, 11, 12, 13]. Recent studies have also shown the association between ingestion of water containing relatively low levels of arsenic (∼5 μg/L) by pregnant mothers in the USA with adverse effects on babies and infants including low birth weight, lower mean gestational age, reduced newborn length, and increased respiratory tract infections [14, 15, 16]. Furthermore, arsenic in drinking water >5 μg/L, compared with arsenic in drinking water <5 μg/L, has been associated with a 5–6 point reduction in IQ in children in Maine [17•], and low to moderate arsenic levels in drinking water (<50 μg/L) have been associated with increased cardiovascular disease incidence and overall mortality in US populations [12, 18], as well as with several cancers [19, 20, 21, 22]. A recent paper by the National Institute of Environmental Health Sciences (NIEHS) researchers concludes that existing “data call for heightened awareness of arsenic-related pathologies in broader contexts than previously perceived. Testing foods and drinking water for arsenic, including individual private wells, should be a top priority to reduce exposure, particularly for pregnant women and children , given the potential for life-long effects of developmental exposure” [3•]. In 1993, the WHO set 10 μg/L as a standard for arsenic in drinking water. However, many developing countries still have 50 μg/L as the maximum allowable concentration, mostly due to the high cost of remediation to meet the 10 μg/L standard . In the USA on January 22, 2001, the US EPA lowered the public drinking water standard for arsenic from 50 to 10 μg/L and established the goal of zero arsenic in drinking water. On January 23, 2006, the state of New Jersey lowered the acceptable levels of arsenic in all drinking water, both public and private, to 5 μg/L, the lowest arsenic drinking water standard in the world. Unfortunately, in the USA, authority under the federal Safe Drinking Water Act is limited to public, not private, drinking water systems, and so, a large number of people living in rural and sub-urban areas with wells remain exposed to levels greater than 10 μg/L. For example, approximately 43 million Americans drink well water and the United States Geological Survey (USGS) has estimated that three million people in the USA are exposed to well water with arsenic concentrations exceeding 10 μg/L [25, 26, 27•]. In addition, although public water supplies serving more than 25 people are required to provide water containing <10 μg/L of arsenic, as of 2014 about 500 rural public utilities are in violation . In some towns in Maine, as many as 60 % of private wells contain high levels of arsenic (>10 μg/L, and in some wells, levels are as high as 3100 μg/L) from naturally occurring sources, exposing roughly 130,000 individuals to arsenic that exceeds EPA and WHO standards [13, 29, 30]. In parts of New Hampshire, 20 to 50 % of private wells have arsenic levels greater than 10 μg/L [31, 32, 33, 34]. Other states in the USA with unusually high arsenic levels in well water include Arizona, California, Colorado, Illinois, Michigan, Minnesota, Nevada, New Mexico, North Carolina, North and South Dakota, Oregon, Texas, and Vermont, and arsenic concentrations in well water in these states have been measured even at levels greater than 1000 μg/L, which is similar to levels found in Bangladesh [24, 35, 36, 37]. Blood levels of arsenic up to 8 μg/L have been measured in a rural North Carolina population indicating significant exposure to arsenic . Although most epidemiological studies have been conducted in populations exposed at considerably high arsenic levels in drinking water, several recent studies suggest that even low-level exposure to arsenic increases the incidence of cardiovascular disease, bladder and lung cancer, and overall mortality not only in Southeast Asia , but also in US populations [12, 18]. While most attention has been traditionally paid to chronic exposure to inorganic arsenic through drinking water, recent studies have called attention to significant human exposure to arsenic in food, most notably via consumption of some rice and rice-based products [3•, 12, 20, 24, 40, 41, 42, 43, 44, 45, 46, 47•, 48, 49, 50, 51, 52, 53, 54, 55, 56, 57, 58, 59, 60, 61]. Application of pesticides containing arsenic by cotton, tobacco, grape, and apple growers in the South Central USA in the 1950s has resulted in accumulation of low levels of arsenic in treated soils [49, 52, 59, 62, 63]. Food plants, such as rice, that take in and accumulate arsenic, both naturally occurring and anthropogenic, from the soil pose potential health risks to humans who eat them on a regular basis [7•, 8, 9, 41, 42, 43, 44, 45, 48, 50, 51, 64]. A recent study suggests that arsenic exposure in food is a significant source of overall exposure. Analysis of the US National Health and Nutrition Examination Survey (NHANES) database revealed that for individuals drinking water >10 μg/L inorganic arsenic, total exposure to arsenic is 24–26 μg/day, with approximately 30 % of intake from food [47•]. By contrast, for individuals living in homes with water arsenic concentration <10 μg/L, inorganic arsenic exposure is 9–12 μg/day, with 54–85 % of intake from food [47•]. Dietary exposure to arsenic in food and water has been estimated by the European Food Safety Authority (EFSA) to range from 1.48 to 2.09 μg/kg/body weight/day for infants, toddlers, and other children and 0.44 to 0.64 μg/kg/body weight/day for adults . As noted above, some rice contains significant levels of arsenic: however, levels vary depending on a number of factors. For example, a market basket survey found that the arsenic content of rice grown in South Central USA is higher than that of rice grown in California and that, in general, brown rice contains more arsenic than white rice [61, 63]. In addition, some rice-based products including toddler formulas and energy bars, especially those made with organic brown rice syrup, have been identified as major contributors to arsenic exposure [43, 44, 45, 48, 49, 60]. Furthermore, some fish, shellfish, meat, poultry, dairy products, and cereals are also dietary sources of arsenic [50, 63]. Seafood contains organic forms of arsenic, such as arsenobetaine, which is thought to be less toxic than the inorganic forms that are found in water; however, the toxicity of arsenolipids and arsenosugars in seafood is not well described [51, 54, 55]. Because rice is a major food source for more that one half of the world’s population, ingestion of rice contaminated with arsenic is a significant and potential public health crisis . Thus, rice consumption should be considered when designing arsenic reduction strategies in the USA and worldwide. Recognizing the need to address the issue of arsenic in rice, Consumers Union, publisher of Consumer Reports, suggested eating no more than two or three servings of rice each week . It is interesting to note that on average, consumption of about 0.5 cup/day of cooked US rice is comparable to drinking 1 L/day of water containing 10 μg/L of arsenic . It has been estimated that eating three portions of rice-based infant food/day could represent a significant source of inorganic arsenic (1.59 to 1.96 μg/kg/body weight/day) . However, eating less rice is not an option in many parts of the world where rice is a major food staple. Thus, strategies need to be developed to reduce the amount of arsenic in ingested rice, especially for toddlers and young children and for pregnant women . In addition to rice as a dietary source of arsenic, arsenic levels exceeding 10 μg/L have been measured in some brands of apple juice, although the source of arsenic is unknown [58, 65•]. On July 12, 2013, the US Food and Drug Administration (FDA) stated that apple juice containing more than 10 μg/L of arsenic could be removed from the market and companies could face legal action. Consumers Union has suggested a limit of 3 μg/L of arsenic in apple juice [65•]. At the present time, there are no recommended maximum levels of inorganic arsenic in food by the US FDA or the European Food Safety Authority. However, in recognition of the potential threat to public health, the WHO (July 2014) recommended worldwide guidelines for safe levels of arsenic in rice, a maximum of 0.2 mg/kg of inorganic arsenic for white (polished) rice and 0.4 mg/kg for brown (husked) rice (JOINT FAO/WHO FOOD STANDARDS PROGRAMME, CODEX ALIMENTARIUS COMMISSION, 37th Session, Geneva, Switzerland, July 14–18, 2014). New research by Andrew Meharg, reported in the Daily Mail newspaper (November 16, 2014), has found that more than half of Britain’s rice products exceed the proposed new EU recommendations for arsenic in food. Interestingly, only three countries have set standards for total arsenic in food (China, 0.15 mg/kg in rice, and Australia and New Zealand, 1–2 mg/kg for seafood ). Although numerous state and federal agencies, scientists, educators, and reporters have dedicated a significant amount of effort to inform the public on the widespread presence of arsenic in water and food, much remains to be done since there are no regulations on arsenic in food in the USA (with the exception of arsenic in turkey meat and eggs; Code of Federal Regulations, Title 21, Volume 6, April 1, 2014) and most other countries, and there are few regulations on arsenic in private well water worldwide. Furthermore, even when the public is informed, a surprisingly low number of people exposed to arsenic in water and food take action to reduce exposure [29, 30]. Several recent high-profile articles in Consumer Reports on the presence of arsenic in rice and rice-based products as well as extensive print and TV coverage on studies identifying significant amounts of arsenic in some rice-based toddler formulas have raised awareness [43, 44]. However, more work needs to be done to make the public aware of the presence of arsenic in the water and food supply, and new strategies must be developed to convince government agencies to set standards and to convince the public to take action to reduce arsenic exposure. In January 2015, the European Society for Pediatric Gastroenterology, Hepatology and Nutrition (ESPGHAN) Committee on Nutrition made several recommendations on consuming rice and rice-based products for infants and young children including the following: (1) Arsenic intake should be as low as possible, and rice drinks should be avoided; (2) Regulations should be set and enforced for arsenic in foods and drinks containing rice products, and (3) For rice-based formulas for infants with cows’ milk protein allergies, the arsenic content should be stated and the risks associated with consuming these formulas should be declared . The Committee also stated that more data are needed to determine the arsenic content of a variety of foods, as well as the impact of arsenic in food on public health to develop evidence-based recommendations regarding the acceptable arsenic content in different foods . Taken together, these recent studies identify water and food, especially rice and rice-based products and apple juice, as significant sources of arsenic exposure. Although little research has been published on the health effects of arsenic ingested in food, compared to arsenic ingested in drinking water, in an abundance of caution, it is reasonable to suggest that dietary arsenic should be reduced. However, many farmers do not have access to arsenic-free water and soils to grow rice, and a majority of people worldwide need to eat rice. We anticipate that innovations in water treatment, identification of arsenic-free water sources, the development of new approaches in genetics, microbiology, and agriculture and even cooking practices will reduce, and we hope eventually eliminate, arsenic from drinking water, as well as rice and rice-based products and other relevant foods. On the basis of the most recent scientific evidence and the fact that the WHO and the US EPA list arsenic as the number one chemical of concern with regard to public health, we who participated in the MDI Biological Laboratory Human and Environmental Sustainability Summit 2014 on the Environmental and Human Health Consequences of Arsenic are committed to reducing exposure to arsenic, building awareness and education about its health impacts, and developing a committed network of stakeholders to achieve these goals. We believe that citizens, scientists, food manufacturers, farmers, water purveyors, and policymakers at the local, state, national, and international levels should work together to achieve five goals, each of which will be the emphasis of a dedicated team with a champion(s) to facilitate progress. Recent epidemiological studies have shown that exposure to low levels of arsenic in drinking water in the USA, as low as 5 μg/L, may have adverse health effects, including increased rates of respiratory infections and reduced IQ in children [14, 15, 16, 17•]. However, the level of arsenic that causes no harm and the effects of arsenic in food on public health are not well studied. Thus, we propose that research be conducted to identify the lowest level of arsenic in water and food that is not associated with adverse health effects, especially for vulnerable populations such as pregnant women, children, immuno-suppressed groups, and folic-deficient populations. At the present time, the US EPA has set a standard for arsenic in public water supplies of 10 μg/L. We propose that the EPA consider lowering the standard to 5 μg/L for public water supplies, following the lead of New Jersey, and that they enforce the 10 μg/L standard for public water supplies that do not meet the standard. Recognizing the complex landscape of federal, state, and local regulatory and non-regulatory programs, we recommend strengthening collaborations among government agencies, the private sector, NGOs, academia, and others to increase private well testing and reduce exposure to arsenic in private water supplies. In addition, we encourage the US FDA to set appropriate standards with consideration of vulnerable populations for arsenic in food including rice and rice-based products at the WHO recommended levels of arsenic in rice (a maximum of 0.2 mg/kg of inorganic arsenic for white rice and 0.4 mg/kg for brown rice). Furthermore, as more research is conducted to examine the health effects of arsenic in water and food, we recommend that the US EPA and FDA as well as the WHO and the EU consider, on a regular basis, evaluating and updating the regulations. We propose to work with the EPA and FDA to achieve these goals. It is imperative that new approaches be developed to rapidly and inexpensively identify arsenic levels in ground water, to remove arsenic from drinking water [15, 27•, 66], or to identify alternative sources of water that are arsenic-safe. We encourage ongoing studies to develop models to predict well water arsenic concentrations based on arsenic levels in regions of similar geology  and an understanding of exposure pathways due to the subsurface hydrological flows . Development of whole-cell bacterial and cell-free biosensors of arsenic are encouraged [69, 70], as is the development of methods to remove arsenic from water including durable inorganic filters, well-aerated coarse sand filter beds, granular ferric adsorption systems, and hybrid anion exchanger (HAIX-NaoFe)-based treatment as arsenic removal media [71, 72, 73, 74]. Further, alternative water sources, such as surface water sources, or aquifers or parts of aquifers that are free of arsenic could be identified and developed for the water supply [27•]. In addition to developing novel and cost-effective technology for identification and reduction of exposure to arsenic in water, it is necessary to encourage individuals using private water supplies to test for arsenic and, when indicated, install systems to eliminate arsenic from their water supply or to seek alternative supply sources [27•]. Many people are not aware that their water supply may contain arsenic, many do not know how to test and remediate, and many individuals ignore or forget the test results . In addition, many household arsenic treatment systems are not effective for a variety of reasons, for instance, well water composition varies from well to well, the system is not always maintained and monitored by the homeowner regularly, and the market for household arsenic treatment system is unregulated . This underscores the benefit of changing to an arsenic-free water supply, where feasible, which can ensure that drinking water remains safe by eliminating the need to treat and test on a periodic basis. Thus, a major goal is to facilitate the development of technology to reduce exposure to arsenic in water and to inform the public of the need to and options for remediation or for finding alternative sources of water. At the present time, there are significant impediments to the public who would like to reduce arsenic in their water supply, including a lack of a single reliable (public) source of information that describes the options for water supply and recommendations for remediation. With support from the CDC, the New Hampshire Department of Environmental Services (NH DES) is developing a model internet-based application that will enable well users to enter their well water test results and view recommendations regarding appropriate treatment options based on their overall water quality profile (arsenic and other contaminants that affect the selection of options); tools such as this should improve the ability of well users to make informed decisions about alternative treatments or water sources. Public and freely accessible tools need to be developed across other states and countries. The NH DES application is expected to be available to the public in mid-2015. The USGS is developing water supply technology in glacial aquifers (that overlie high-arsenic bedrock aquifers) that will potentially eliminate exposure to arsenic in private supplies (US Patent Application 14/488,097). Several approaches are under investigation to reduce arsenic uptake by rice. Investigators have identified a number of candidate genes that may be responsible for arsenic uptake by rice plants, and we encourage efforts to identify cultivars that do not accumulate arsenic in the grain and to develop ways to bring this rice to market [49, 52]. Rosen and his colleagues have created transgenic rice and transgenic soil microorganisms that have the ability to turn arsenic into gas, which is eliminated from the rice plant . Pinson and her colleagues have studied more than 1700 strains of rice and have identified varieties that accumulate different levels of arsenic even when grown under identical conditions . Another approach to reduce arsenic in rice is to add microbes to soil to make arsenic less accessible to plants (US Patent 8,318,636, Compositions and Methods for Improved Rice Growth and Restricting Arsenic Uptake. Issued: November 27, 2012). Moreover, removing the husk and converting brown rice into white removes most of the arsenic, which accumulates in the outermost layers of the grain, although other minerals and nutrients are also removed in this process. One of the easiest solutions to reduce the amount of arsenic in rice is to use three times more arsenic-free water than rice when cooking, and rinsing the rice before and after cooking, an activity that reduces the amount of arsenic in rice by 30 % . Also, aeration of contaminated groundwater during irrigation has been found to significantly reduce arsenic uptake by rice by causing the co-precipitation of arsenic with iron, a commonly occurring co-contaminant of arsenic . The team that will work on this topic is dedicated to enhancing the development of novel and cost-effective approaches to reduce arsenic exposure in juice and rice, while encouraging the consumption of non-contaminated rice, the major food staple in the world. On July 12, 2013, the US FDA announced new draft guidelines that limit the amount of arsenic in apple juice to 10 μg/L; however, to date, the FDA has not set an enforceable standard for arsenic in apple juice. We recommend that the FDA follow up on their draft guidelines to limit arsenic in apple juice, and all juice, especially those consumed by children, to 5 μg/L, and that additional research be conducted to determine “safe” levels of arsenic in juice. Given the widespread ingestion of apple juice by children, and the potential for adverse developmental effects caused by arsenic, this is an important issue requiring both surveillance and communication. The plan will provide background information on arsenic, provide a rationale for arsenic education, and include suggested activities, references, and links to resources for K-12 and community educators . Examples of existing and planned education projects will be included. One example is a collaborative initiative that emerged from the 2014 Arsenic Summit to create and pilot a national model of environmental education that encourages schools and community organizations to work together to address the public health risks of exposure to arsenic in drinking water. The objectives of this initiative are the following: (1) Create an “All About Arsenic” (A3) website with activities, resources, and links to existing groundwater curricula, a data portal with mapping capabilities, and a blog for students. The site will host case studies that result from this pilot project. (2) Link three Community Health Partner (CHP) organizations to teachers and students in seven schools in Maine and New Hampshire so that they can collaborate on arsenic monitoring and mitigation projects. (3) Develop guidance criteria for sub-awards to CHPs and schools to fund their collaborative projects. (4) Work with schools to adapt existing groundwater curricula to focus on arsenic, well water testing, and collaboration with CHPs. (5) Document the collaborative process between schools and CHPs so that other communities in the USA can implement similar projects. Anticipated outcomes include increased environmental health literacy of all project participants, increased self-confidence of teachers to engage in collaborative environmental education projects with community partners, a growing pool of young people with sufficient research and collaboration skills and scientific knowledge to be effective environmental stewards and develop interest in environmental health careers, additional data and fine scale maps of arsenic in Maine and New Hampshire, and case studies to facilitate project replication. In conclusion, we who participated in the MDI Biological Laboratory Human and Environmental Sustainability Summit on August 13–15, 2014 titled “Environmental and Human Health Consequences of Arsenic” are committed to reducing exposure to arsenic, building awareness and education about its health impacts, and developing a committed network of stakeholders to achieve these goals. We will meet again in August 2015 to develop and discuss more detailed plans to achieve team goals to (1) establish science-based evidence for setting standards at the local, state, national, and global levels for arsenic in water and food; (2) work with government agencies to set regulations for arsenic in water and food, to establish and strengthen non-regulatory programs, and to strengthen collaboration among government agencies, NGOs, academia, and others; (3) develop novel and cost-effective technologies for identification and reduction of exposure to arsenic in water; (4) develop novel and cost-effective approaches to reduce arsenic exposure in juice and rice, while reassuring the public about the consumption of rice, a major food staple in the world; and (5) develop an Arsenic Education Plan to guide the development of K-12 science curricula as well as community outreach and education programs that serve to inform students and consumers about arsenic exposure and engage them in well water testing and development of remediation strategies. This Summit was supported by the MDI Biological Laboratory, Nature’s One®, Inc., the University of Arizona Superfund Research Program, the Dartmouth Superfund Research Program, Axelrod Becker Consulting and Christie’s America. The findings and conclusions in this study are those of the authors and do not necessarily represent the views of the US Department of Health and Human Services or the US Centers for Disease Control and Prevention. Use of trade names and commercial sources is for identification only and does not constitute endorsement by the US Department of Health and Human Services or the US Centers for Disease Control and Prevention. This article does not contain any studies on humans or animals. World Health Organization. Guidelines for drinking-water quality: incorporating first and second addenda to third edition. 2008;1—Recommendations http://www.who.int/water_sanitation_health/dwq/gdwq3rev/en/ Accessed 12 April 2015. 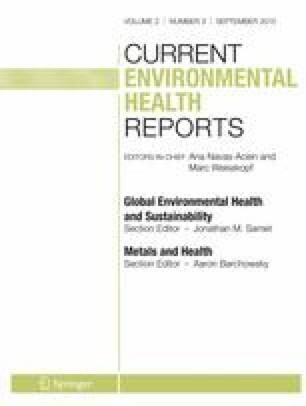 Agency for Toxic Substances and Disease Registry case studies in environmental medicine: arsenic toxicity. 2011 http://www2a.cdc.gov/TCEOnline/registration/detailpage.asp?res_id=2243 Accessed 12 April 2015. Agency for Toxic Substances and Disease Registry. Arsenic toxicological profile. 2007 http://www.atsdr.cdc.gov/ToxProfiles/tp.asp?id=22&tid=3 Accessed 12 April 2015. Nielsen MG, Lombard PJ, Schalk LF. Assessment of arsenic concentrations in domestic well water, by town, in Maine, 2005–09: U.S. Geological Survey Scientific Investigations Report 2010–5199. 2010:68 (http://pubs.usgs.gov/sir/2010/5199). Consumer Reports. Arsenic In Your Food. 2012 http://www.consumerreports.org/cro/magazine/2012/11/arsenic-in-your-food/index.htm Accessed 12 April 2015. Carrington CD, Murray C, Tao S. A quantitative assessment of inorganic arsenic in apple juice: U.S. Food and Drug Administration. 2013 http://www.fda.gov/Food/FoodborneIllnessContaminants/Metals/ucm280209.htm Accessed 12 April 2015. Consumer Reports. FDA data show arsenic in rice, juice, and beer. 2014 http://www.consumerreports.org/cro/news/2014/01/fda-data-show-arsenic-in-rice-juice-and-beer/index.htm Accessed 12 April 2015. This update on arsenic in rice, juice and beer contains links to other reports by Consumer Reports listing the amount of arsenic in rice and rice based products.